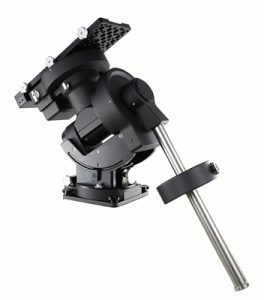 Recognizing the growing demand for an accurate and stable equatorial mount with the versatility to carry larger instruments and more complex imaging arrays, iOptron has extended its revolutionary center-balance design to the greater-than-100-pound-payload class with the CEM120. iOptron’s unique “center balance” design yields stability, accuracy and smooth mechanical operation, characteristics that become increasingly critical as payloads rise. The center-balance design is inherently stable due to its positioning of the center of gravity of the payload directly over the center of the pier or tripod. The CEM120’s performance is demonstrated by its low periodic tracking error of ±3.5 arc seconds. The CEM120EC increases tracking accuracy to less than 0.15 arc second RMS. The CEM120EC2 utilizes two high resolution encoders, one on each axis. The two encoders enable the mount to perform dual axes tracking. With advanced sky modeling the CEM120EC2 accounts and adjusts for polar alignment error as well as changes in atmospheric (refractive) distortion. Fixed home sensors on each axis, allow the mount to save alignment models after power off too to be used on future nights. Along with the stability aspect, the CEM120 features an advanced cable management system that provides more ports in more locations preventing tangle ups and reducing the chance of fractured cables. It also includes Wi-Fi and LAN for remote operation and reliable, easy-to-use clutches on both axes. Other features include precision azimuth and altitude adjustment with a range to latitude zero and a built-in 32-channel GPS system. The CEM120 weighs just 57 pounds (26 kilograms), yet is capable of a payload of 115 pounds (52 kilograms). – Precision altitude and azimuth adjustment. The iOptron CEM120 is priced at $3999US, the CEM120EC is $5500US and the CEM120EC2 is $6,998US. For more information, visit iOptron.com.